NPC Blog: Dowlass Moss; So near and maybe not so far? Dowlass Moss; So near and maybe not so far? The NPC has an impressive record of cave discoveries and exploration. Before I joined in 2015, I remember perusing Northern Caves on many a winter evening; and a handful of clubs seemed to account for a disproportionate number of discoveries. Of course, the Gritstone Club and Yorkshire Ramblers, each formed around 200 BC (or something like that), were prolific; they were having their heyday in cave exploration before the NPC was even a twinkle in the eyes of our founding members. The Moldywarps appear frequently too; particularly the Northern Dales, which they had pretty much to themselves, as many cavers had little interest until recently. The Northern Pennine Club makes an extremely prominent appearance, seemingly pipping many of the other large Dales clubs in number of discoveries, and rivalling the prolific and tenacious spirit shown by clubs such as ULSA in their early days. Indeed, the NPC can be proud of its history of discovery and exploration. 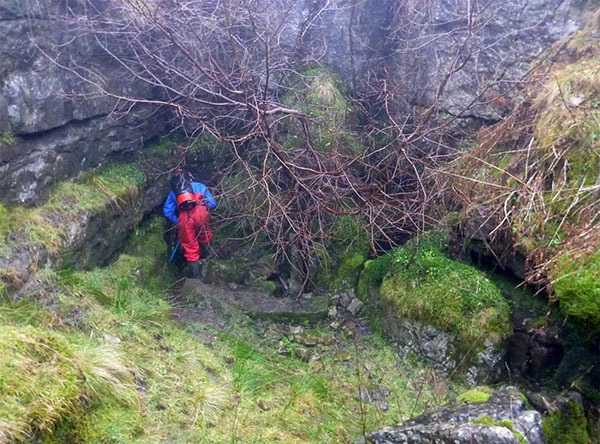 Finding new cave in the Yorkshire Dales isn’t quite so easy these days; not only have all the walk-in entrances long since been explored (well not quite, there are still some if you know where to look, but that’s another story altogether). Many of the easily diggable ones have been tackled too. People these days seem to have busier lives, and travel from further afield to get to Greenclose, and so time is precious, and the magnitude of the potential projects is so much more daunting. This seems to have culminated in a slowdown in the pace of new exploration and the people seeking it out. The NPC are not alone amongst most of the larger Dales clubs in seeing an excellent proliferation of sporting caving activity, but a reduction in new exploration efforts. Don’t get me wrong; I think the NPC is the best caving club in The Dales (although as Chairman of York Caving Club, I cannot say best club in Yorkshire). From the warm welcome Gary (my partner) and I received when we started visiting Greenclose as guests, to the excellent trips and weekends we’ve had as NPC members; there really is no better club to be part of right now. However, I have always had the nagging feeling that, with such a tremendously active membership, should the club not be making a renewed push for new exploration? Sunday’s at Greenclose can be a sedate affair; licking the wounds from an excellent trip the day before, and nursing a slightly groggy head from the fine selection or red wines consumed to excess the night before, under the bad influence of more senior Pennine members. The enthusiasm to do something is evident; but this does not always manifest itself as the packing of several tacklesacks for another underground epic. I am guilty of this more so than anyone. Following a few discussions, a handful of us decided that maybe we should start to do some Sunday prospecting. An area that was top of my list was Dowlass Moss. Not only is this area on our doorstep but it also has tremendous potential. This boggy fell links the edge of Ingleborough Estate at Pillar Holes around to the track coming up from Crina Bottom near Skirwith and White Scar. It’s a vast expanse of limestone fell with relatively few known major caves. The Red Rose put substantial effort into Dowlass Moss in the late 1990s and through to about 2005; this work paid off with the discovery of Trapdoor Pot, and the extension of Boggarts Roaring Holes to the full depth of the limestone. I’ve had a fascination with Trapdoor Pot since my first trip several years ago. This isn’t a trip for everyone; there are many tight sections, awkward SRT, dangerous boulder chokes and loose pitches. However, I found the cave characterful and charming. Each ‘hard’ bit was discretely separated by larger sections such that the cave was never relentlessly horrid, and the final Megatron pitch (about 40m in a massive wide shaft) serves as a timely reminder of what might still be waiting to be found in this area. The Red Rose seem to have methodically prospected all the major open holes on the fell, and reported it all in RRCPC 10. The beerswilling Bull Pot Farmers might not be able to tell their Merlot from their Shiraz, but they certainly know how to write up their work in a good journal. Credit where it’s due! However, since about 2005-2010 they report having abandoned Dowlass in favour of better prospects elsewhere. Their closing remarks enthuse about the future on Dowlass Moss. But to the best of my knowledge, nobody has been actively exploring there since their departure. Back in February this year, myself, Gary and Dewi took our first Sunday recce trip onto Dowlass Moss, in cold drizzle and thick fog. Thank goodness for Dewi’s phone which had full GPS and map capabilities; without this I doubt we’d have found anything. Our aim was to have a wander around and see what there might be to explore up here. In the thick fog, we passed numerous shakeholes, including Trapdoor Pot, and then Boggarts, Gritstone Sink, and eventually reaching the final major shakehole on Dowlass Moss, the remote Fulcrum Pot. This had caught my attention when studying the maps and Northern Caves; two streams converging at a sizable shakehole and vanishing. Fulcrum Pot was indeed massive, a several metres deep, 20m long quarry-like shakehole, and two streams did indeed sink here. However, it became quickly apparent that digging here wasn’t going to be a walk in the park. Fulcrum Pot lies the best part of an hour walk from the cars, much of it uphill and then across a bog. Work here would involve an immense scaffold and chemistry operation. Walking back along the contours of the hill towards the footpath, more holes were encountered, some of them 10+m deep, many with ancient spits from predominantly Gritstone Club, ULSA and NCC original explorations. A return with some tackle and on a slightly better day was required to re-examine some of these for digging potential. We did return about a month or so later armed with ladders, ropes, a larger team, and this time good visibility! Many holes were descended, including Thorn Pot, Stock Pot, Loose Pot, amongst all the others in this vicinity, all more or less confirming the accuracy of the Red Rose reports. Stock Pot was found, as Red Rose reported, to draft very strongly indeed. Consequently, a team comprising several NPC folks were ushered on mass up onto Dowlass Moss with capping gear and other digging paraphernalia during April, after obtaining all necessary permissions. 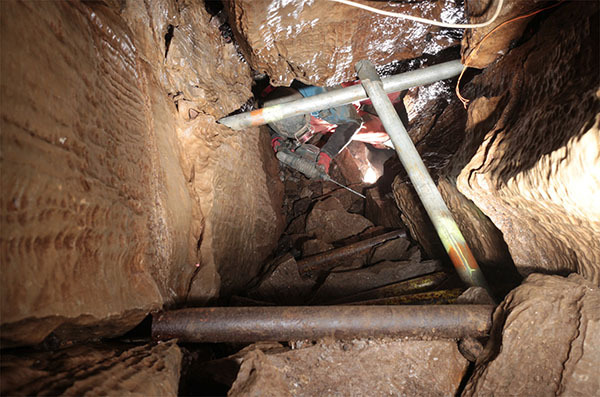 Two leads are present here; one is at the bottom of the main shakehole, where a narrow fissure drops several metres, and one is down a separate fissure accessed only by a small hole at the top of the main shakehole (this was widened significantly by Red Rose), and which terminates in a tiny chamber. While capping in the latter, smoke was found to blow up into the main shakehole, so clearly the two digs are all part of the same air circulation system. A tremendous draft comes from somewhere down there, but getting to it was going to be a major undertaking with no clear route of attack. Our enthusiasm for Stock Pot was fairly short lived. During a walk back from our third session at Stock Pot; we decided to cut the corner off the hill and we ended up walking back via a cluster of shakeholes on the lower slopes of Dowlass Moss. One caught my attention; a clearly modified slot dropping down at the bottom of a small shakehole. Being the only person in full caving gear at the time, I was elected to go down and have a look. An enlarged fissure dropped awkwardly, and then to my surprise I found myself standing on top of a squelchy rotten wooden ladder! A short climb down and I was in a chamber on top of a mound of dig spoil held back by a scaffold frame. longabandoned dig. At the bottom of the frame, a narrow fissure continued over bones, emerging head-first over a pitch! The awkward manoeuvre required here wasn’t something I fancied on my own so I headed out and enthused to the others about this rather exciting looking, and apparently Some further research identified this as Canary Pot, dug, not surprisingly by the ubiquitous Red Rose, and ironically also located by them on a walk back from Stock Pot. Oh, how time seemed to be repeating itself. A return to inspect this more closely was needed and so we did, the following day, when just Gary Douthwaite and I headed up the hill for a quick look. The pitch mentioned above is a scaffolded shaft, dropping 4 metres (with some excellent and reassuring scaffolding and walling skills on display). A side-step into a second rift then drops another 4 metres. Another shuffle across drops a few more metres into another rift, and below this, the scaffolding seems to run out, and a dig-face was reached at a depth now of probably over 15m from the surface. What was particularly exciting was the good draft blowing upwards from the bottom of the hole. There was no doubt at this depth that this draft must be coming from a cave! We were prevented from descending to the active face on this first visit due to some concerning hanging death where the Red Rose scaffolding ended, and so we returned a few weeks later with some NPC poles. A few well positioned bars made it safe enough to drop down to the very bottom, where we found another fissure dropping a further 2m, but only about 10cm wide. This is the limit reached bythe Red Rose, and represents the starting point for the NPC efforts. A relentless capping effort then commenced, causing respectable destruction. Gary was a few metres below me, performing the delicate operations, while I passed equipment back and forth as it was required. The fumes from each pop were quickly carried up the shaft by the draft; at no point did bad air become problematic! In fact, I was soon getting a little chilly in the draft! Soon enough, stability once again became problematic. More scaffolding was needed. John Cordingley kindly volunteered to ‘run’ some bars up for us in advance of our next visit. Running up Ingleborough sounds hard enough, but doing it carrying scaffold bars is another matter. Thanks John! A further visit on 8th July saw some of this scaffolding installed, but little further downward progress due to the shortage of stacking space. Future visits will initially need a team of at least seven people to form a haulage line from the active face to the first chamber (where there is ample stacking space) to help clear some room. Once this is done, more scaffolding can be installed and further downward progress can be made. The fluting of the limestone, the fact this is an active flood sink, and the strong draft are all encouraging signs. This is an excellent long-term project to carry on with. Quite what we expect to find is unknown. There is no known Master Cave anywhere from Hurnell Moss all the way around to near the start of White Scar, covering all of Dowlass Moss, yet there are countless sinking streams. The relationship of the potholes on the upper slopes of Dowlass (e.g. Trapdoor, Stock Pot, Fulcrum Pot and all others on the same altitude) to those such as Canary Pot on the lower slopes (50m lower) is not yet known. Red Rose speculate that the ‘Main Event’ of Dowlass Moss has yet to be found. Surely as our nearest caving fell, the NPC should be proactively continuing this search? This project is open to all NPC members. You are extremely welcome to get involved, and we hope that at the very least a team will be able to head up to Canary Pot on the Sunday of the Committee meeting weekends. However, anyone is welcome to gather a team and go up there at any time to continue the dig in the NPC name. The only expectation is a short report in the cottage log book or on the forum of progress, an open invite to any members staying at Greenclose at the time of the trip, and efforts to keep other members and the Committee informed (e.g. via this newsletter). Currently, a crowbar, hammer, chisel, hauling buckets and ropes for the shafts are all in-situ (please leave these in place). However, equipment such as capping gear (and drill) and scaffolding materials are not, so groups need to take these items themselves. It’s only a half hour gentle uphill walk. The rotten wooden ladder just inside the entrance has been replaced with an aluminium one. 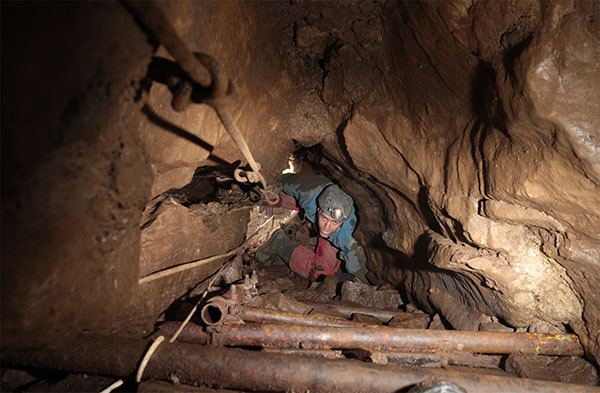 Even if you’re not too keen on the digging, feel free to pop up there at some point (a helmet and boiler suit is sufficient) for a look down and see what all the fuss is about. Park on the Ingleton to Clapham high level road, about 30m east from the junction with the Cold Cotes road at SD720715. There is a track (not a public footpath) up Ingleborough from here starting at a gate with a built-in ladder. Follow the track uphill for about 1km until it takes a prominent right turn, parallel to some limestone scars on the right. Here, depart the path by continuing straight on/bearing slightly left (heading slightly towards the field wall). After 100m, a large ‘bowl’ shaped depression contains several shakeholes, one of which is Canary Pot (SD72507262).